I grew up on Jiffy Pop on the stovetop, shaking it away, pulling open the foil and the great smell through the house, it was so much fun back then in the 70's. Then my brother Luke, became the guru so to speak on making popcorn on the stove with grandma's old saucepan and boy was it ever the best to eat, fresh popped, butter salt, buttery flavored oil, with age it became the best seasoned pan in the world to make popcorn in. Then somehow we got into the microwave age and the fast and furious was born. While going out to shop, I noticed Orvilles jar corn to be quite a bit more expensive today than Jolly Time in the resealable bag. Orvilles was 4.99 for a one pound nice jar. Jolly Time was 4.49 and for a two pound bag, so who cares about the jar with that much more popcorn and a real money saver? So, guess what, being the thrifty shopper and lover of my good ole faithful, Jolly Time came home with me. Now I can use my great new masons jars to put that popcorn in with double the popcorn for my money! The linings of microwave-popcorn bags may contain a toxic chemical called perfluorooctanoic acid, or PFOA, which is used to prevent the food from sticking to the paper. According to the Environmental Protection Agency (EPA), PFOA is a likely carcinogen. "We don?t know all of the hazardous effects of PFOA yet, but we have some evidence of a link to cancer, as well as to effects on the immune, nervous, and endocrine systems," says David Carpenter, MD, director of the Institute for Health and the Environment at the University at Albany. As I was scrolling through Pinterest (my favorite new site,) I saw this pin and article from The Cherry on Top blog and Squawk Fox was it's originator. When I read how bad microwave popcorn was in those little store bought bags and how they talked about published results from various studies that have been found, I knew I wanted to write about this. Our microwave popcorn eaters are exposed to toxic vapors, and consuming a lot of popcorn popped in those little white bags has been associated with lung disease (called Popcorn Lung!) really Snopes.com said it's true!. That alone is enough of a reason to stop buying these so called “healthy” snacks in the supermarket. I wanted to share that knowledge with my readers as well. I was skeptical that this worked and tasted as good, but it does! Thank you, to those two sites for this valuable information. 1 brown paper bag (I bought 50 for $.99 at my local grocery) Note: in the photo I used the red for presentation and poured the cooked corn into the bag after it was popped as shown in the video... the Hallmark red bags are perfect to send off to school lunches found in the card sections of the supermarket. I wouldn't try using them to pop with because of the dye on the bags. Again you will see that in the video below. Add the popcorn to the bag, fold down the top of the bag twice, do not tape or staple. Microwave for around 2 1/2 minutes and listen if and when the popcorn slows down considerably popping then just shut off microwave, 3 minutes may be too long and make it burn. You can add salt or whatever you want. I already have a hot air popper but lazy to get it out since this is fast easy works and considered safer, it's all I need in a hurry. I spray it with some no calorie butter spray, salt and pepper and good to go. There are plenty of toppings to try, my favorite is sprinkling Parmesan cheese mixed with a dash of garlic powder and dash of cayenne pepper. Other suggestions with seasonings you can choose are Cajun seasonings, white cheddar, there are refrigerated butter sprays that are calorie free or even sprinkle with a mixture of cinnamon and sugar while it's still warm for a mock kettle corn. If using thin cheap bags, double bag it. Bags are reuseable, just dump old kernels and fill again. Always make sure you turn over the folds more than two or three times so the edges on face down tightly secured or bag with stand up and pop all over the place. I've always heard that microwave popcorn wasn't very healthy for a number of reasons. I typically do the hot air popper, but like you said, sometimes I just don't feel like getting it all out. I will definitely try this method! We love our popcorn for snacking! I certainly remember the "stove top shaking" Jiffy Pop, which was a lot of fun. I do agree with you about making your own popcorn is not only better, but you can add the flavors that you want, and make it your way. Love the "bag" idea to make them with! Your videos are getting better, and better...love it! I remember Jiffy Pop. It was a real treat. All of the kids would have to watch it pop, that aluminum ball of popcorn magically appearing on top of the pan. Your method seems so easy. I have not seen Jiffy Pop in years...this is such a great idea! I never knew about all the dangers with the store bought bags...yikes! Very interesting! I am still stuck in the dark ages with cooking pop-corn in a pan! I like the way you do it and will try it as my children (and I!) really like pop-corn. Brava! Ciao! I do the same thing Claudia! It makes the best popcorn! Wowww Claudia..this is amazing! I love this...I have to try it!!! Thank you so very much for sharing!!!!! I do like adding my own toppings. I grew up on freshly popped popcorn. My kids grew up on both. Fresh is definitely better. Looks welcoming. Congrats on the the Top 9 today! Congrats on your Top 9, Claudia!!! Hooray! This is such a cool idea! :) My wife will love this, and congratulations! This is totally awesome. My mother used a M.W. Bowl with a lid and added a teaspoon of water and garlic mixture for her Garlic Popped Corn it was good however there was some popped corn a tiny bit wet. I have always loved stove top popcorn. Thank you for sharing! My munchkins will love it! Easy enough for them to do as well. I have tried this and I'm so delighted that it works! Never really liked the microwaved stuff . . . and Mr, Rosemary still craves it the good old-fashioned way for a quick snack. But I like the less-mess of this idea. Genius! I make popcorn like this all the time and it works like a charm! This is such a cool idea! I can't wait to try this! What a great way to cook all natural pocorn. I was abit worried about the smell of those store bought microwave pop corn. It does seem toxic. Have given those up and have been using the wok to make pop corn. This is such a good tip though if I could find brown bags here. I have done this before. It is a great idea! A new study came out a few days ago saying that the PFCs in microwave popcorn also make vaccines less effective. You can google "popcorn and vaccines" and find several articles on it. This is great to know. I long ago ditched the microwavable popcorn in favor of an air popper, because I have a son that could live on popcorn. I didn't like all the junk he was eating in those bags. 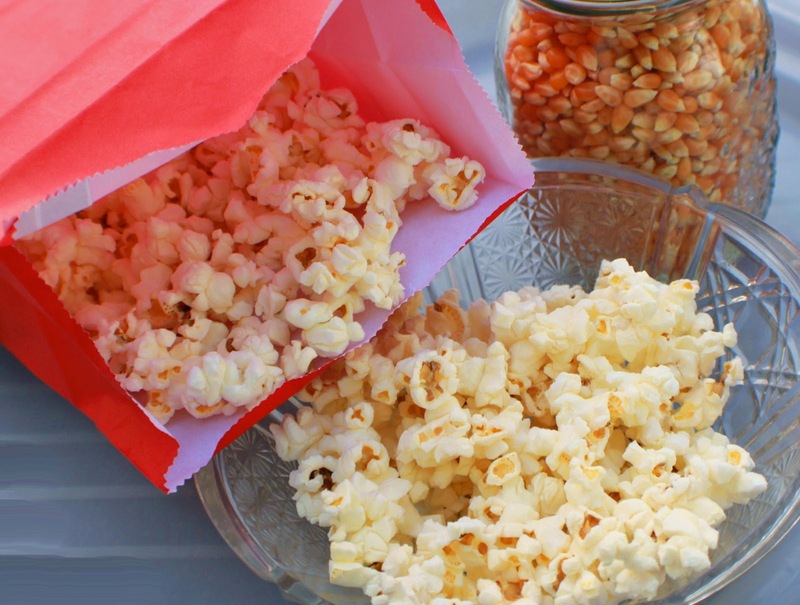 Popcorn is so simple to make and tastes so much better than all those artificial flavors.